Photo: Volunteer Master Gardeners receive training. Garden Organic. Master Gardeners offers local people and communities free food growing advice and support. 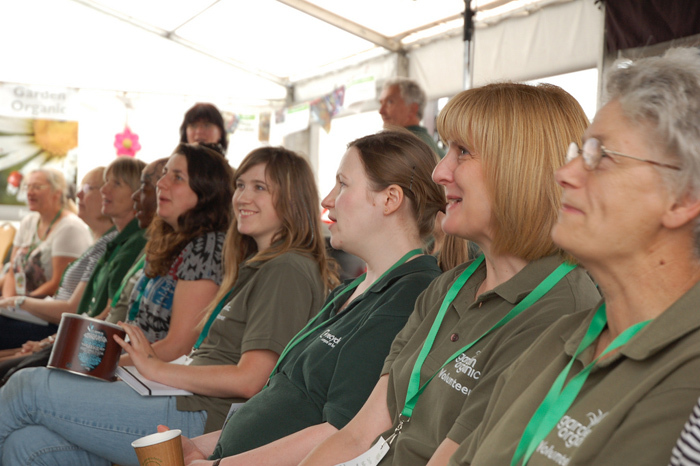 The network of enthusiastic volunteers are fully trained and supported by the UK’s leading organic growing charity, Garden Organic. You can also email us fgslondon@gardenorganic.org.uk to find out about our volunteer school food growing workshops or visit FGSL Training. Ask your children's teachers what their plans are to get their school growing food, and how growing food fits into the curriculum. Join the PTA and raise the subject at the PTA meetings. Offer to organise a food growing event such as a stall at the schools fete. Encourage your children to grow a few vegetable seeds at home and take any extras to school to swap with their friends. Organise a coffee morning after school drop off and find out who the expert growers are amongst the parents and brainstorm ideas on how you can help and encourage the school to get children growing food. What can you do as a local resident? Find out which of the schools in your area are growing food, or would like to start and ask what you can do to help. For those that aren’t growing find out why and see what you might be able to do to help. For example find out whether there are any food growing projects going on in your area and put them in contact with parents and teachers. Here are some ideas of what you can do to help your local school grow food. Donate - have you got any spare vegetable seedlings or plants you could give to your school? Donate some growing space - give part of your allotment plot to a local school who do not have any of their own land for children to grow vegetables on. Involve your local Councillor - ask them whether there are any spaces that local schools could use to grow food. Even if you are not an expert grower yourself you’ll find people who are, as well as finding out a lot more about what’s going on in your community, making loads of new friends and useful contacts in your local area on the way! You’ll get to know your fellow parents, neighbours, teachers and school community much better and your volunteering work may even give you something to put onto your CV if you are taking a break from work!